Television legend and Texas native, Larry Hagman has died at age 81. In a long, successful television career that spanned 62 years, Hagman was well known for his diverse roles. Two of his most famous roles were as J.R. Ewing on "Dallas" for over 13 years (357 episodes), and Major Anthony "Tony" Nelson on "I Dream of Jeannie" for 5 years. 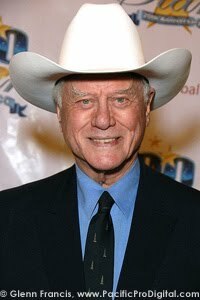 From 1952 - 1956, Hagman served in the Korean War in the U.S. Air Force and he spent most of his time entertaining the troops. In 1995, Hagman underwent a life-saving liver transplant. His organ transplant inspired him to work to promote healthy living. He served as the chairman of the American Cancer Society's annual Great American Smokeout for several years. He also worked to promote the National Kidney Foundation. Although Hagman's largest successes were on television, he also played roles on the stage and in film. He continued working through 2012 on a new revision of "Dallas" which was filmed on site in Dallas, Texas for TNT. Hagman’s final wishes were slightly unconventional. He asked to have his remains scattered over a fields of wheat and marijuana so that in a couple of years, a marijuana cake could serve up to 300 people. He wanted to share himself with those who remained behind. American television cartoon voice actress Lucille Bliss’ pioneering voice career brought joy and laughter to millions of children. She voiced television’s very first animated character, Crusader Rabbit (1949), and famously played the popular “Smurfette” character through nine seasons of “The Smurfs” through the 1980’s. She hosted popular bay area kids program. “The Happy Birthday Show” and took roles for Walt Disney in Alice In Wonderland, and our favorite 101 Dalmatian’s where she was dubbed for the "Canine Crunchies" commercial and all pup voices. Her career spans generations from Hanna Barbara favorites like “The Flintstones”, to Don Bluth’s “The Secret of Nimh” and most recently “Miss Bitters” on Nickelodeon’s “Invader Zim” animated series. We thank you Ms. Bliss for your creativity and undying love for the child in all of us.